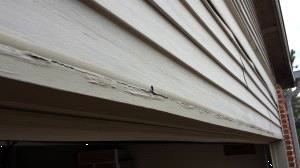 Prevent Wood Rot Over Garage door! 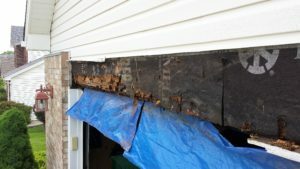 Don’t let the wood over your garage rot internally when you can do this one simple fix to prevent wood rot over wide openings, like a garage door! Almost every house I look at has this scenario. Here we have a rotten trim board over a garage opening that doesn’t stand a chance. All the water that hits the siding above lands in the J channel and runs until it finds the seam. This is a recipe for disaster! You will never prevent wood rot this way. I’ve seen contractors try to caulk the J channel to prevent this, but vinyl expands and contracts way too much to depend on caulk. Look at this one! 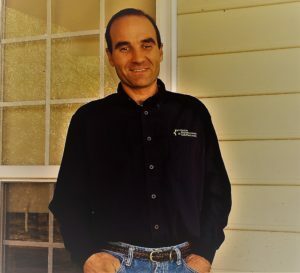 Let’s look at a more dependable solution to prevent wood rot…metal flashing! By adding a Z flashing, as it is commonly referred to, this rotting can effectively be prevented. The repair involves removing the siding above the trim board and installing the flashing against the sheathing. Nail it high to avoid penetrations low on the metal where the water will be. You can also set it in a bead of caulk to be sure that no water gets behind it. You can bend your own if you have a metal brake or buy the pre-bent version shown here. I found this at our local home center. Bending your own, ensures that the horizontal distance between the two bends matches exactly to the horizontal protruding distance of you wood trim. 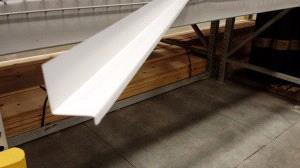 If you need to use more than one length over your trim board, then lap the seam and use a good urethane caulk to seal the joint. When the rain comes rolling down your siding now your wood will be protected from its greatest threat… water! I truly hope that these posts help you to make your home a more peaceful and enjoyable place for your family!